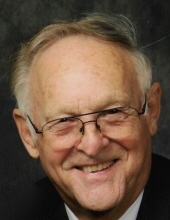 Raymond Fox, 88, of Rockville and formerly of Marshall, Indiana, passed away Wednesday, January 23, 2019 at Clinton Gardens. Born June 16, 1930 in Marshall, Indiana, he was the son of Clarence and Lula Mae Van Vactor Fox. Raymond is survived by his wife of 63 years, Jane Cahill Fox. They were married on October 1, 1955 in Rockville. Raymond graduated from Marshall High School in 1948 and served in the U.S. Army from 1951-1953, stationed in Germany. Raymond retired as a rural mail carrier. He previously delivered LP gas for Overpeck Gas in Marshall and owned and operated Hockett-Fox Insurance in Marshall. He was a member of the Marshall Federated Church where he was an Usher and Trustee for many years. He was also a 50 year member of the Marshall Volunteer Fire Department and a regular at the Marshall Coffee table. He truly loved and enjoyed his family; he was a proud father, Grand Pa and Great Grand Pa. His hobbies included golfing, walking in the woods, hunting in his earlier years and tending to his apple orchard. Fox’s Orchard brought him much joy from planting the seedlings to baking an apple pie. Raymond spent most of his life in Marshall, Indiana. He wrote a book Marshall the Way We Were, recounting his youth growing up in the town he loved. Also surviving are two children, Kathy Jones of Bloomingdale and Mike Fox (Kelly) of Westport, Indiana; 3 grandchildren, Zachary Jones (Neysa), Brittany Shannon (Tyler) and Stacy Fox; 3 great grandchildren, Jaxton, Hendrix and Bexley Shannon and 2 sisters, Eva Kay Muir and Carol Monnett. He is preceded in death by his parents; son-in-law Roger Jones; grandson, Jonathan Fox; 3 sisters, Lucille Watson, Margaret Goeke and Linda Moore and 2 Brothers, Robert Fox and his beloved younger brother and great friend, Kenneth Fox. Funeral services will be Sunday, January 27, 2019, at 3:00 p.m. at the Marshall Federated Church with Rev. Brian Holt officiating. Visitation will also be Sunday from 1:00 p.m. until the time of the service at 3:00 p.m. Burial will follow in Poplar Grove Cemetery, north of Marshall. Barnes and Rice Funeral Home of Rockville assisted with arrangements. To send flowers or a remembrance gift to the family of Raymond Fox, please visit our Tribute Store. "Email Address" would like to share the life celebration of Raymond Fox. Click on the "link" to go to share a favorite memory or leave a condolence message for the family.